Documentation of the healing abilities of healers became a huge priority for Elizabeth (and should for you too!) after realizing, through discussion and observation with her new clients, that some of the “new age” healing modalities that they were trying, were not giving the desired results. Given her abilities to “see” energetic fields and perceive negative imprints and programming that disturbed or compromised the life force field, it was clear that undesirable imprints were not being cleared and even more unsettling, she could see that in many cases, her clients and practitioners were taking on some of the imbalances into their own energy fields. Elizabeth Patric began administering remote healing energy transmissions in 1997, beginning with the discovery of the amazing energies of Lao Tzu that he has made available to us in his Ascended Master state. (See her website www.lahochi.com). It is an easily learned, effective energy healing system and is noted for its “Seal of Protection” so that the healer does not “pick up” the negative imprints and programming of the client. As you begin to understand your multidimensional self, you will comprehend how there are “octaves” or frequencies of energies available to us that will address the different layers of our energetic totality. Lao Tzu’s energy originates from what is known as the 13th octave. Over the years Elizabeth has learned and assimilated other octaves of healing and transforming energies that she offers. There are beautiful Angelic and Ascended Master frequencies that come from various octaves, the most sublime Universal Mother Mary energies coming from the 15th octave and amazingly powerful energies from the Nature Spirits of love and light frequencies that come from the 17th octave. Elizabeth discovered (and offers her own version of ) the Trivedi healing energy transmissions in early 2010 and has intensively studied these energies with Mahendra Trivedi for 4 and ½ years (In his prestigious Master Healer Program) and continues to do so. These powerful energies interested Elizabeth because there was an emphasis on scientific research and documentation. She has participated in several of his remote healing research projects and the photos above come from one of the projects. 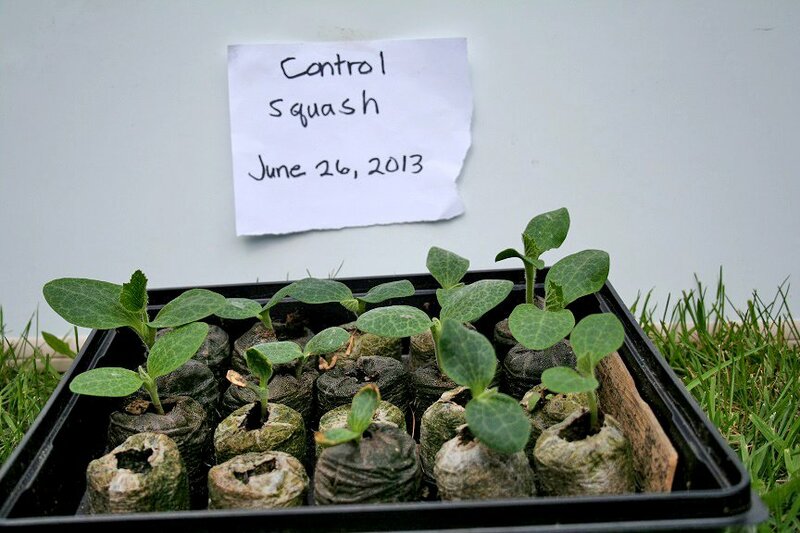 The photo on the upper left shows what is called a control group of squash plants that did not receive any energy transmissions. The photo in the center shows plants that received 5 healing energy transmissions. 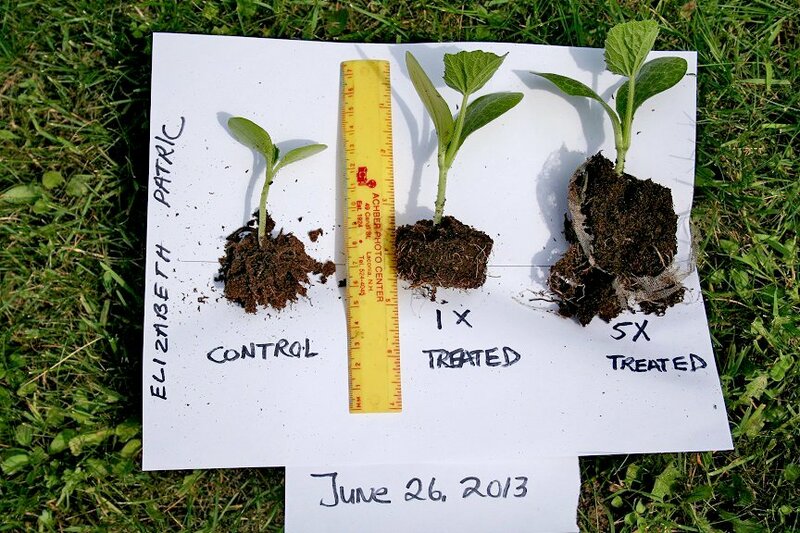 The photo on the right shows a comparison of the root systems of the plants receiving energy transmissions as contrasted with the ones that did not. Over and over again it can be demonstrated that the plants receiving healing energy transmissions have more stamina, strength, pizzaz, vitality, more deeply colored leaves, healthier veining in the leaves, less disease, less pests, stronger stems, and a much stronger and more complex root system. Also the plants always have a “good feeling for the eyes” and demonstrate a more exalted, “glad to be alive” look to them. 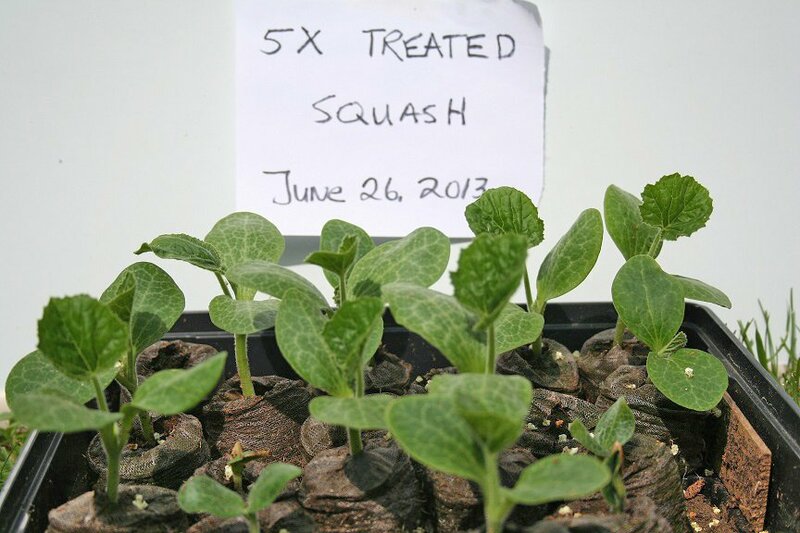 If plants can benefit like this, why can’t you? When administering healing energy transmissions for your healing and transformation, Elizabeth connects your soul to the God of your understanding and then you and your soul decide and partake of any of the energies of love and light frequencies that are available. Being able to partake of the energies of various octaves allows for your healing to proceed in grace and ease. A power line cannot receive Niagara Falls all at once. The energy has to be stepped down through “transformers” to get all that power. It is the same for your healing, you must take steps, energetically for your complete transformation into your most unlimited potential and expression of your soul destiny. Along with the Flower Essence Collections, you have an unprecedented pathway to become the most enlightened blueprint of your body, mind and spirit. Contact Elizabeth or call her at 1-800-850-6839 or 1-715-272-1593 if you are interested. She will want to talk with you, sense your situation or “landscape” and get to know the members of your household, including pets, plants, and your surroundings. She will be able to activate the non-physical nature spirits of love and light frequencies in your environment. Remember that these prices include everyone in the household. All family members, pets, plants, the house itself, the surroundings on all octaves are included. The healings take place while you sleep which has been shown by research to be the time that you are most receptive to these energies (as well as being very convenient!). Also the energies can be assimilated and integrated all night long. 1) The energies that you will receive are guided by your soul and spirit. Without your intentions and desires, you would not receive these energies. What you receive is what is auspicious for you and what you, your higher self and the God of your understanding have decided on. One participant might receive gentle heart energies, while another might experience a huge blast of shakti, while another may not feel anything. It is best not to judge your experience, but the important thing is to think about the accomplishments and results of the healings. 2) Remember, you are the one that is shaping the healing, you will receive exactly what you can experience, integrate, translate and assimilate in grace and ease. Elizabeth does not determine what you need. You and your soul and your spirit along with the God of your understanding determine this. 3) If you feel groggy after a healing, this is not a “bad” symptom. It means that you had quite a transformation and are still adjusting to the difference in your frequencies. 4) If you find that you are tired, do your best to get a little more sleep. Just because you are initially tired, it doesn’t mean you will always be tired after a transmission. It just means that there is a lot of healing taking place and the highest quality healing takes place during high quality sleep. By listening to your body and its possible need for sleep and acting on that, you will set up better communications with your body and it will know that you are going to take care to get plenty of sleep and it will be able to enthusiastically bring momentum to your healing and transformation. 5) Some evenings you will receive more energy from one type or another. The divine decides and that decision is based wholly on what you want and also the deepest desires of the soul and spirit which you may not be as aware of. It is easy for the energies to co-mingle. Your body, mind and spirit may need different octaves. One may want the Lao Tzu energies while another might want the Universal Mother Mary energies, while another might want the Trivedi Shakti. It is all good!!! Currently, our evolving light bodies may want to receive “chords” or frequencies. Much like a piano can play one note, or play chords of notes, so we are needing chords of octaves for our most complete expression of God’s Grace for our totality. All of these energies can be received in a harmonious way. All of these energies are specified each and every time to be of only love and light frequencies. 7) Remember to turn off radios, TVs, computers, music etc. The more of this kind of dissonance that can be turned off, the more likely it is that you can receive the really subtle frequencies that will nudge your towards the most complete expansion of your awareness and consciousness. 8) Do be patient, all is in perfect divine order and our healing and transformation take its own time. Just as a child takes 9 months to develop in the mother’s womb, your own process is going to take its own time.